Yesterday AT&T announced that it would start offering the Nexus 6 pre-orders on November 12th, and as it turns out, that was a Nexus 6-related date that you could actually trust. The 12th is here, and pre-orders to get the Nexus 6 from the carrier are now available online and in stores. 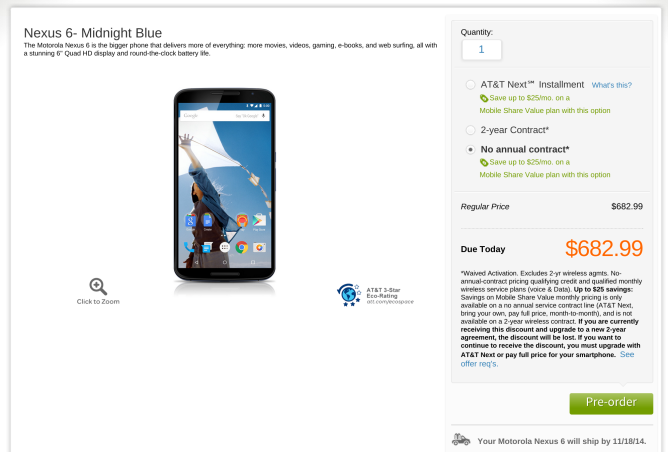 Altogether, AT&T wants $682.99 for the Nexus 6, but you can chop that up using whatever Next payment plan you prefer or cut it down to $249.99 by signing a two-year contract. Whichever approach you take, the phone should ship out roughly one week from today, on November 18th. The carrier's price is significantly higher than the $649.99 a 32GB Nexus 6 will go for on the Play Store, but Google's shipping fee somewhat cancels this difference out. On the other hand, AT&T doesn't appear to offer much in the way of choice just yet. As of now, I only see the 32GB Midnight Blue model. AT&T will also take $50 off a Moto 360, Moto Hint, or Moto Sliver II if you pair one with the purchase of a new Nexus 6. If this appeals to you, you have until January 8th to take advantage of the deal.